Are people addicted to nail biting? Studies show that 26% of the population bite their nails, in other words almost 3 out of 10 people. Among young adults between the ages of 21 and 25 it is as high as 42%. In other words, you are certainly not alone if you want to kick the habit. (source: Ipsos research with 1000 respondents: Nail biting - Survey in France (representative for Europe), iOmnibus research - November 2014. Prepared for Oystershell). What are the causes of nail biting? What are the main reasons for stopping nail biting? There are masses of bacteria on your hands and nails. Nail biters bring these bacteria into their mouths over and over again, and so run the risk of infection. By wetting your nails regularly, the nail gets weaker. This can lead to eczema or other fungus infections on your fingers. Your dried saliva can form undesirable odours on your finger tips and nails. Long-term nail biting can lead to incorrect nail growth, and as a result nails can become ingrown. Finger tips will look ugly, since there are constantly little pieces of skin or tiny wounds on them. These little wounds in turn lead to a higher risk of other infections. Biting your nails can also cause physical complaints. If children swallow their bitten-off nails, this can lead to stomach ache. What is the best way to stop nail biting? Scientists Korizky and Yechiam carried out research among 80 nail biters at the University of Haifa. The study showed that there are two effective therapies to help stop nail biting: behavioural therapy and aversion therapy. Raylex® combines these two therapies for the first time. Behavioural therapy is a technique to change behaviour gradually. Contrary to what people think, behavioural therapists do not or only rarely work with a system of punishments in order to stop a particular kind of behaviour. Instead, they use a system of rewards to help learn to change behaviour. Punishment only makes it clear what one should not do, but not what the desired behaviour is. When applied to nail biters, this means that it is a good idea to agree on a period of time during which they will not bite their nails. If they make it through this period, they can claim a reward.That is exactly what the Raylex® app does. Aversion therapy is a well-known technique in behavioural therapy which is used mainly for treating unhealthy impulses that give a person satisfaction. When applying this therapy to nail biters, a bitter substance can be applied to the nails. This bitter substance produces an immediate reflex. That is, the person will taste the bitter, disgusting flavour in his or her mouth for a given period. The person will therefore be conditioned to begin to loathe nail biting. It comes down to learning to have a negative reaction or aversion towards something that was previously a source of satisfaction. And that is what the Raylex® pen does. What is nail biting anyway? Nail biting is a reflex that nail biters cannot easily keep under control and that they do unconsciously over and over again. Children often imitate the nail biting of their parents. How do I open the Raylex pen correctly? Firmly hold the pen with both palms, pen in one hand, cap in the other hand. Pull the cap with a firm and steady grip. To avoid damaging the pen please do not crank, turn or bend. Can I use Raylex longer than 18 days? For some of us 18 days is not enough to kick the bad habit. If the temptation to bite once more on your nails is too big, keep using Raylex. You can use Raylex as long as you want to. Raylex is a real friend in need. Can I use Raylex to prevent/unlearn thumb sucking habit? 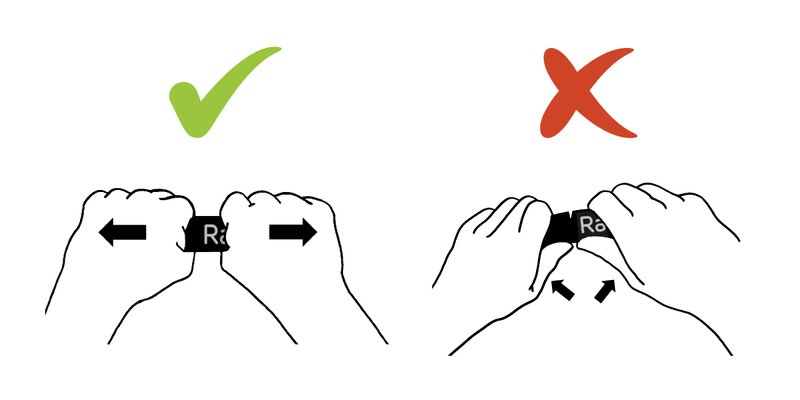 Raylex can also be used to unlearn thumb sucking habit by children from the age of 3. Raylex does not contain parabens or any other preserving agents. Can Raylex be used by pregnant women? It is recommended not to use Raylex during pregnancies. There is no research on the use of Raylex during pregnancy. Can I use Raylex before I put my contact lenses? You can use Raylex if you wear contact lenses. Idealiter you first put your lenses before you put on Raylex your fingernails. If you first putted Raylex, wash your hands carefully. If you forget to wash your hands, you might feel a slightly burning sensation.